At the Council of State meeting earlier today,. 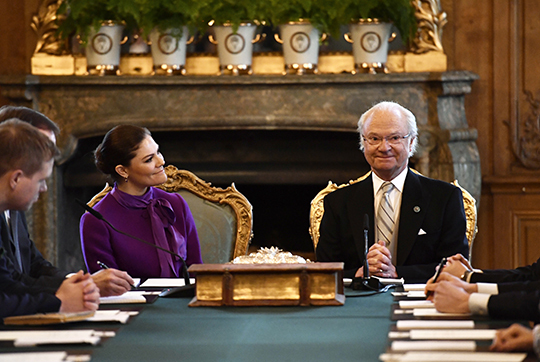 King Carl XVI Gustaf announced the names and duchy for his newest granddaughter. The new princess has been named Adrienne Josephine Alice. She is the Duchess of Blekinge. Princess Madeleine gave birth on March 9th at the Danderyd Hospital in Stockholm to a princess. The Council Meeting was followed by a Te Deum at the Slottskyrkan. 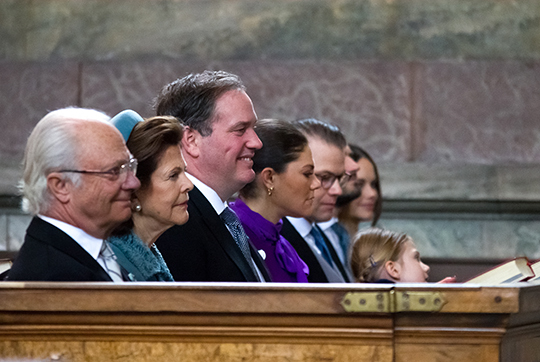 This service was attended by the King and Queen, Crown Princess Victoria, Prince Daniel, Princess Estelle and Christopher O'Neill, who is married to Princess Madeleine. Joséphine de Beauharnais (1807-1876), the daughter of Eugen, Duke of Leuchtenberg and Princess Augusta Bavaria. In 1823, she married Crown Prince Oscar of Sweden and Norway, who succeeded as King Oscar I in 1844. Josephine is also the first name of Christopher O'Neill's paternal grandmother, Josephine Cesario. Alice is the first name of Queen Silvia's mother, Alice Sommerlath. According to Swedish royal genealogist (and a good friend of mine), Ted Rosvall, three descendants of Dagmar von Arbin, have the name Adrienne. Dagmar, who was born Countess Dagmar Bernadotte af Wisborg, is the daughter of Count Carl Bernadotte af Wisborg and Baroness Marianne de Geer. Count Carl was the son of Prince Oscar Bernadotte and Ebba Munck. Dagmar's daughter, Madeleine von Arbin is married to Baron Gerhard de Geer af Finspang. Their eldest daughter is named Jana Adrienne and their second daughter is named Adrienne Ebba Sophie. Baroness Jana de Geer is married to Johann Gummeson. They have a daughter, Adrienne Maria Madeleine Gummeson de Geer. Dagmar von Arbin will celebrate her 102nd birthday on April 10. The name Adrienne also appears in the Empress Josephine (consort of Napoleon) family as her great-great-grandmother was named Adrienne Dyel de Graville. Queen Josefina of Sweden, consort of King Oscar I, was her granddaughter. Swedish magazine, Sevensk Dam reports that the name Adrienne is a favorite of Queen Silvia. In the 1990s, Adrienne Riddez met the Queen at a charity event. The Queen allegedly told her "Oh, your name is Adrienne, it's such a beautiful name. I was considering for Madeleine." The palace has not confirmed the story, but Adrienne Riddez made the comment on Facebook, and then clarified that the story was true. None of the articles about this, including the one in Svenska Dam, identify Adrienne Riddez is. According to rastis.se, there is only one Adrienne (Louise Isabelle) Riddez in Sweden. She is 32-year-old Lutheran pastor. According to Hola, a Swedish newspaper, Svenskdam, has published that Adrienne was the name initially chosen by Queen Silvia for Madeleine. Queen Silvia said that to a lady named Adrienne in a public engagement in 1990.